A duo, trio or quartet of OTT Opera Singers and a pianist who wants to be one! An ensemble that brings together highly talented singers performing a sparkling concoction of operatic and musical highlights by Handel, Mozart, Rossini, Puccini, Verdi, Bizet, Delibes, Donizetti, Britten, Bernstein, Gershwin, Sondheim and Porter. offers a line-up of four specialist baroque soloists to perform solos from Handel’s Messiah in lavish period costume using the theatrical gesture of the time. In 2007 Opera Cocktail soloists performed with Adrian Partington and the Bristol Choral Society – they were so delighted that they have been invited back in 2008. Buddug and her associates come from a variety of backgrounds and can deliver workshops on team-building projects involving singing, performance and presentation. Buddug has been a vocal coach and director at the Royal Welsh College of Music since 1999 and has taught privately for the past 20 years. Bertha from Mertha – a spinster from Merthyr who is desperate for anything in trousers! Boudicca the Butcher – demonstrations on how to skin a flee! 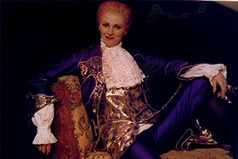 A one-woman play, which relates a sensational episode in the life of the fictional castrato Pedrolino Il Magnifico. The time is 1700, the place Rome; the Pope has banned women from performing in public. Young boys are sold to the church and castrated to keep their high voices. Consequently, castrati performed the female as well as the male roles, were adored like pop stars and discovered the perfect disguise for visiting a lady’s boudoir. Castradiva weaves a tale of the amazing lives of the castrati around some of the finest arias Handel and Gluck wrote for them. Seven arias and seven scenes tell the story, populated by six characters adorned with costumes, wigs and commedia masks. Ranging from love to murder, subterfuge to stupidity - tragedy and comedy combine in an extraordinary story. The music is provided live on authentic instruments (harpsichord, viola da gamba and baroque violin). Critics through the ages have often murdered a diva's performance through the power of a pen, but now it's time for the divas to get their revenge!... or is it justice? Join the Welsh Clouseau - Detective Inspector Gethin Gumshoe as he delves into the operatic underworld to find out WHODUNNIT! Written and directed by Chris Harris (a comic genius), A Knife At The Opera gently pokes fun at critics, performers, detectives and anyone else who takes themselves too seriously, including the show's principal performer, the critically acclaimed virtuosic mezzo soprano and actress Buddug Verona James. The roles of detective and divas (six prime suspects – Miss Macho, Miss Bagwitch, Miss Baroque, Miss Acrobatics, Miss Diva and Miss Dot Demisemiquaver) are all played by Buddug Verona James, accompanied on the piano by Andrew Wilson-Dickson. The comic story is intertwined with seven arias by Handel, Mozart, Rossini, Bizet, Tom Johnson and Andrew Wilson-Dickson. This show is for anyone who loves music, Gavin and Stacey, Fawlty Towers, Inspector Clouseau, Maria Callas, Farinelli, Dylan Thomas, Tales of the Unexpected and Sooty. A recital of folk songs from around the globe arranged by classical and contemporary composers including Haydn, Brahms, Ravel, Weir, Dove, ap Sion and Wilson-Dickson. 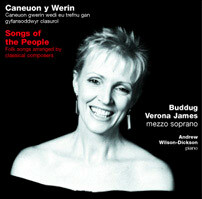 (New CD Released– Songs of the People). Classsics by Gershwin, Porter, Arlen, Schwarz, Styne and Sondheim accompanied by an acoustic jazz trio. This song recital demonstrates something of the special nature, quality and variety of Spanish songs of the twentieth century. Some of the greatest names in Spanish music are represented – de Falla, Granados and Rodrigo – together with one of Spain’s most famous writers, Federico Garcia Lorca. ‘Even a Spaniard would find it hard to equal the plangent intensity of her singing de Falla's Siete Canciones Populares’. Vivaldi's oratorio 'Juditha Triumphans' tells the story of Judith's bravery in confronting (and dispatching) King Holofernes. Handel's oratorio 'Hercules' is centred on the character of Hercules' wife, Dejanira, whose mad jealousy leads to her killing the man she most loves. Arias from each oratorio are linked together to tell the complete story (accompaniment Welsh Baroque Orchestra). Buddug first performed the role of Juditha at the Vivaldi Festival in London. She has performed the role of Dejanira in Scotland, England, Wales and Croatia. 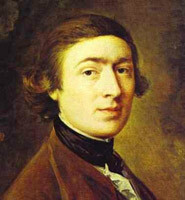 This evokes the social and musical life of a cultural provincial city in the later eighteenth century through the life of this celebrated artist and amateur musician. Images, diary entries, letters and newspaper articles provide the backdrop for the music of Thomas Chilcot, William Jackson of Exeter, JC Bach, Karl Abel, Thomas Linley and Mozart. (With harpsichord, viola da gamba and baroque violin). A fascinating narration describing the castrati of the 18th century, assembled largely from Charles Burney: A General History of Music (London 1782) and John Hawkins: A History of the Science and Practice of Music (London 1776), interspersed with arias written for castrati - Nicolini, Carestini, Senesino, Bernacchi and Guadagni. (With harpsichord, viola da gamba and baroque violin). Handel, the famous Saxon or the Devil? On hearing, but not seeing, Handel play the harpsichord, the virtuoso Scarlatti deduced that the sound must be from either Handel or the devil himself. Andrew Wilson-Dickson conjurs up a dramatic portrait of the famous Saxon as portrayed by his contemporaries, from the flattering and the servile to the indignant and the rebellious. The narrative is interlaced with brilliant moments from Handel's concertos and chamber music, played by the pocket-sized orchestra of violin, viola da gamba and harpsichord.